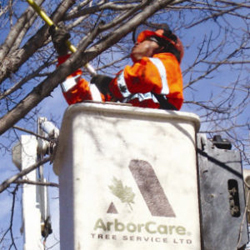 In order to prevent insects from your plants, ArborCare Tree Service offers Horticultural Oil Insect Spray to clients across Western Canada, including Calgary, Edmonton, Kelowna & Vernon. Some Western Canadian insects like leafrollers and tent caterpillars lay their eggs on trees and plants before the winter starts so that their offspring hatch in the spring. To prevent those larvae from hatching on your property, use horticultural oil. The horticultural oil from ArborCare Tree Service offers our clients a way to suffocate wintering eggs. The oil literally blocks the air holes in the eggs. Horticultural oil also has less toxicity than other pesticides and leaves less residue. Using a spray bottle, you can apply the oil onto woody shrubs and other plants just before leaves open and buds break in the spring. We’d suggest waiting 24 hours after the temperatures go over zero for the best effects. Please note that some plants are sensitive to this kind of oil – feel free to ask us during the appointment if your trees and shrubs are safe for horticultural oil application.